St. Kenelm's Church, Clent Hills, Worcestershire. Saint Kenelm (or Cynehelm) was an Anglo-Saxon saint, venerated throughout medieval England, and mentioned in the Canterbury Tales (the Nun's Priest's Tale, lines 290–301, in which the cook Chaunteecleer tries to demonstrate the reality of prophetic dreams to his wife Pertelote). William of Malmesbury, writing in the 12th century, recounted that "there was no place in England to which more pilgrims travelled than to Winchcombe on Kenelm's feast day". In legend, St Kenelm was a member of the royal family of Mercia, a boy king and martyr, murdered by an ambitious relative despite receiving a prophetic dream warning him of the danger. His body, after being concealed, was discovered by miraculous intervention, and transported by the monks of Winchcombe to a major shrine. There it remained for several hundred years. The two locales most closely linked to this legend are the Clent Hills, south of Birmingham, England, identified as the scene of his murder, and the small Gloucestershire town of Winchcombe, near Cheltenham, where his body was interred. The small church of St Kenelm, dating from the 12th century in a village called Kenelstowe, now stands with a handful of houses within the larger village of Romsley in the Clent Hills. For many years, villagers celebrated St Kenelm's Day (July 17) with a village fair and the ancient custom of "crabbing the parson" - bombarding the unfortunate cleric with a volley of crab apples. 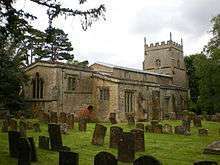 St. Kenelm's, Church, Enstone, Oxfordshire. St. Kenelm's, Church, Minster Lovell, Oxfordshire. 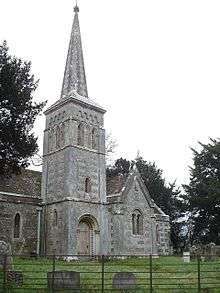 St. Kenelm's Church, Stanbridge, Dorset. 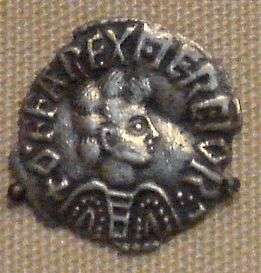 In AD 819, Coenwulf of Mercia of Mercia died leaving two daughters, Quendryda and Burgenhilda, and a son, a child of seven years old, named Kenelm who was chosen to succeed him. Quendryda envied her little brother and thought that, if he were killed, she might reign as Queen. She therefore conspired with her lover, Askobert, her brother's tutor and guardian, and gave him money, saying, 'Slay my brother for me, that I may reign'. In the Forests of Worcestershire, on a hunting trip, the opportunity arose. The night before the hunting trip, Kenelm had a dream in which he climbed a large tree decorated with flowers and lanterns. From on high, he saw all four quarters of his kingdom. Three bowed down before him, but the fourth began to chop away at the tree until it fell. Then Kenelm transformed into a white bird and flew away to safety. On waking, the young king related his dream to his nanny, a wise old woman skilled in interpreting dreams. She wept, for she knew that the boy was destined to die. In the middle of the hunt's first day, young Kenelm, tired and hot, decided to lie down beneath a tree to rest. Askobert began to dig a grave, in preparation for the murder, but the boy suddenly awoke and admonished him, 'You think to kill me here in vain, for I shall be slain in another spot. In token, thereof, see this rod blossom'. As he thrust his stick into the ground, it instantly took root and began to flower. It grew, in years after, to be a great ash tree, which was known as St Kenelm's Ash. Unperturbed by this turn of events, Askobert took the little king up to the Clent Hills, and as the child began to sing the Te Deum, the assassin smote his head clean off and buried him where he fell. Kenelm's soul rose in the form of a dove carrying a scroll, and flew away to Rome where it dropped the scroll at the feet of the Pope. The message on the scroll read: 'Low in a mead of kine under a thorn, of head bereft, lieth poor Kenelm king-born'. Accordingly, the Pope wrote to the Archbishop of Canterbury, who commissioned a party from the Mercian capital, Winchcombe, to seek the body. As they walked, they saw a pillar of light shining over a thicket in Worcestershire and beneath it the body of Kenelm. As it was taken up, a rushing fountain burst out of the ground, and flowed away into a stream, which brought health to anyone who drank from it. The body was then solemnly carried towards Winchcombe, but at the ford called Pyriford over the River Avon, the burial party was met by an armed band from Worcester Abbey who also claimed title to the remains. The dispute was settled as follows: whichever party woke first on the following morning could take the prize. This proved to be the monks from Winchcombe. Despite their agreement, however, they were closely pursued by the Worcester party. Exhausted from their rapid march, they stopped just within sight of Winchcombe Abbey. As they struck their staffs into the ground, a spring burst forth, and this refreshed them so that they were able to press on to the Royal Mercian Abbey at Winchcombe, where the bells sounded and rang without the hand of man. Then Quendryda asked what all this ringing meant and was told how her brother's body was brought in procession into the abbey. 'If that be true,' said she, 'may both my eyes fall upon this book', and then both her eyes fell out of her head upon the Psalter she was reading. Soon after, both she and her lover died wretchedly, and their bodies were cast out into a ditch. The remains of Saint Kenelm were buried with all honour and he has since been revered as a martyr. His feast day is celebrated on July 17, the date of his translation to Winchcombe. 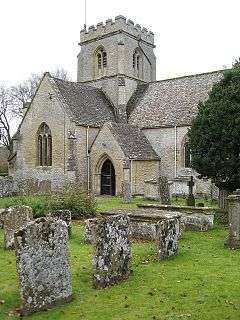 St Kenelm's Church in Sapperton, Gloucestershire. The legend of Saint Kenelm is included in a medieval collection of saints' lives in Middle English known as the South English Legendary, compiled during the thirteenth and fourteenth centuries. It tells a similar story to the one in the twelfth-century manuscript at Winchcombe Abbey, with the following addition: after the murder and secret burial of Saint Kenelm in the Clent Hills, a cow came and miraculously sat at Kenelm's grave, eating nothing all day and returning each night with her udders full. Quendryda had forbidden her murdered brother's name ever to be spoken, and as the memory of him faded, God caused this cow to sit there so that his memory would not disappear entirely. Everybody in the district grew to learn of this cow's strange behaviour, the animal was closely observed, seen to sit by a thorn tree and eat nothing all day but to be miraculously full of milk in the evening and again in the morning, and this went on for many years. The valley came to be known as Cowbach. Then one day, a white dove flew down into the Pope's chapel in Rome carrying a message that Saint Kenelm's body lay in a place called Cowbach, in the Clent Hills. Word was dispatched to Archbishop Wilfred of Canterbury, and a party was sent into Worcestershire, where the local population were able to guess immediately where the body lay, because of the cow. 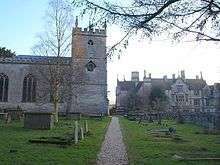 When his body was disinterred, a spring miraculously appeared where Saint Kenelm had lain, as in the Winchcombe version, which is now followed faithfully once more. Like many medieval hagiographies, St Kenelm's legend appears to bear little relation to any known facts. It can be ascertained from the wider historical record that, on the death of Offa of Mercia, his son Ecgfrith of Mercia was crowned but his reign lasted only 20 weeks and he was presumably killed in battle. He was succeeded by a distant cousin, Coenwulf of Mercia, whose son was Kenelm (Cynehelm), and this would appear to be the reputed saint. It is likely that Coenwulf 'hallowed' Kenelm to the throne, for a letter dated 798, allegedly from Pope Leo III to "King Kenelm", names Kenelm and gives his age as 12. In 799, Kenelm witnessed a deed of gift of land to Christ Church, Canterbury, and from 803 onwards his name appears on a variety of charters. The year 811 sees no more mention of Kenelm; this was likely his death year. This all points to Kenelm being 25 years old when he died, not a mere child of 7 years old. Historical records also indicate that Kenelm's sister, Cwenthryth (Quendryda), had entered the cloister at the time of her father's death and was the abbess of Minster-in-Thanet. St. Kenelm's Church Alderley, Gloucestershire adjacent to Alderley House. In the field of literature, St Kenelm is alluded to in Chaucer's The Nun's Priest's Tale and his tale is told in one of William Shenstone's elegies. Francis Brett Young wrote a long poem called The Ballad of St Kenelm, AD 821 and Geoffrey Hill makes direct mention of St Kenelm and Romsley, Worcestershire, in his book-length poem, The Triumph of Love. 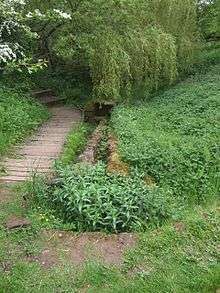 A long distance walk called St Kenelm's Trail links Clent and Winchcombe across the English countryside of Gloucestershire and Worcestershire. John Henry Newman made frequent pilgrimages to the shrine of St Kenelm's martyrdom. St. Kenelm's Church, Upton Snodsbury, Worcestershire. 1 2 3 4 Baring-Gould 1897, pp. 427,428. ↑ D'Evelyn & Mill 1967, pp. 279–91. ↑ Hill 1998, pp. 1,2. Baring-Gould, S. (Sabine) (1897). The Lives of the Saints. 8, part 2. London: John C. Nimmo. pp. 427–428. D'Evelyn, Charlotte; Mill, Anna J., eds. (1967) . "Saint Kenelm, from Corpus Christi College Cambridge MS 145". The South English Legendary: Edited from Corpus Christi College Cambridge MS 145 and British Museum MS Harley 2277. 1. Published for the Early English Text Society by Oxford University Press. pp. 279–291. Hill, Geoffrey (1998). The Triumph of Love. New York: Houghton Mifflin. pp. 1, 2. ISBN 9780395912355. Hogg, Richard M.; Denison, David (2006). A history of the English language (illustrated ed.). Cambridge University Press. p. 228. ISBN 978-0-521-66227-7. Amphlett, J. (1890). A short history of Clent. London: Parker. Farmer, David (2011). The Oxford Dictionary of Saints (Fifth, Revised ed.). Oxford University Press. p. 253. ISBN 0-19-959660-3. Love, Rosalind C. (1996). "Life and Miracles of St. Kenelm". Three Eleventh-Century Anglo-Latin Saints' Lives. Oxford University Press. pp. 49–89. 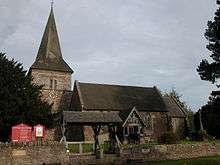 Wikimedia Commons has media related to Saint Kenelm churches in England. The Legend of St Kenelm. Document - probably copied from Amphlett. Book - The Story of Saint Kenelm, Prince, King & Martyr. Aims 'to merge legend and history without changing either'. South English Legendary Saint Kenelm, from Corpus Christi College Cambridge MS 145. Modern English prose translation.